DZone is a news site where software developers share links to web pages that matter to them. Others vote on them, and the top voted links are featured on the main page (popular links). The top 7 or so links each day is gathered again and shown on the special place on the main page (top links). How if you want to follow the top links only? Subscribe to the RSS feed here. DZone adalah situs berita yang berisi tautan yang dibagikan para pengembang software. Orang lain memberi suara, yang suaranya terbanyak akan ditampilkan di halaman utama. Mau mengikuti tautan teratas? Berlanggananlah RSS ini. DZone is a news site where software developers share links to web pages that matter to them. Others vote on them, and the top voted links are featured on the main page (popular links). The top 7 or so links each day is gathered again and shown on the special place on the main page (top links). That was a great source of updated information, I see new information everyday. Naturally, to follow those links without forgetting will be using an RSS reader. (I use Google Reader.) 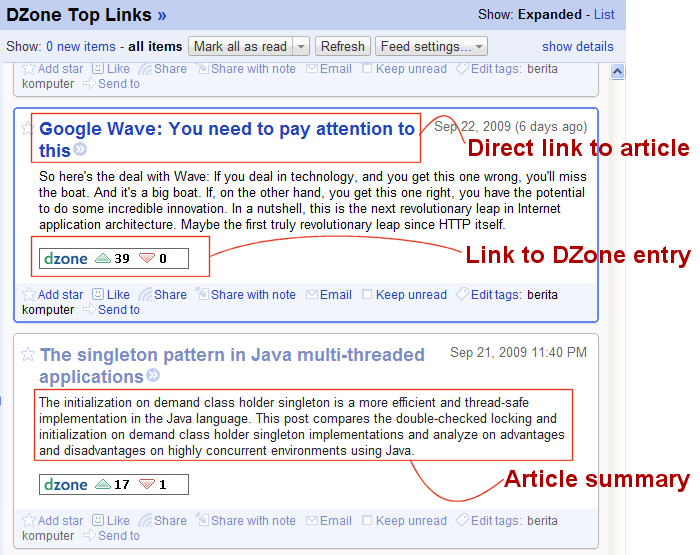 DZone provides RSS feed of their popular links here. It was nice, until I became overflown by incoming links everyday. DZone releases 67 popular links per day, which is enough to make you tired. I want to see what matters more, a.k.a. the Top Links, subscribe at it, and get about 5 links per day, which is enough. But no such RSS feed available at DZone! Too bad, I can't leave DZone but I can't handle too many links too. Recently, I realized that being a software engineer is not an easy task, although computer programming has been my hobby since a few years ago. Compared to other science/engineering majors such as maths, physics, mechanics, and civil, software engineers cannot just learn for several years and become an expert on that for tens of years. Operating systems change. Programming languages change. Network speed changes, what was important in the past become not important now, and vice-versa. So we need to get up-to-date all the time in order to stay competitive and employable. This is a surprising website. I've never thought that there is such a website.